Sega created it and the hero in question was blue, but we’re not talking about Sonic. Sorry my hedgehog friend, but as quick as you are, you were beaten comfortably onto the home consoles by a young duck named Bin. Yes, our feathered-friend in question was the star attraction in the arcade cutesy beat-em-up that was ‘Dynamite Dux’ – a lost classic if ever there was one and no mistaking. Due to some rather shoddy console ports, Dux never really made a lasting impact and young Bin – along with his red buddy Pin (how lucky for him to find a best friend that rhymed) – ultimately lived up to his name and was promptly binned by Sega. And you thought Alex Kidd had it bad. And what a tragedy it is, as it’s a cracking little game, full of humour, colour, weapons, and Colonel Sanders. Yes, that’s Colonel Sanders everyone! Not content with a cameo appearance during the first level (standing outside a KFC conveniently) he also crops up as referee during the between levels boxing match pointsathon. Eighties product placement was a thing of beauty wasn’t it? It’s standard fare really, the sort of game you would imagine Sega would come up with whilst clipping their toenails, nothing new or extravagant, but it’s all done with such love that can’t help but want to give it a big hug. Bin himself is a wide-eyed yet confident little duck, and a rather dapper one at that – he sports a rather natty bow tie throughout. The enemies range from the sublime to the downright bizarre – pigs on trolleys, dogs with no limbs, crazy laughing crocodiles, it’s all like a really bad episode of Animal Hospital. All of whom you can’t help but smile at whilst you bomb them, rocket launch them or simply punch them (holding down fire unleashes a cartoon-style oversized upper cut. Lovely) to smithereens. 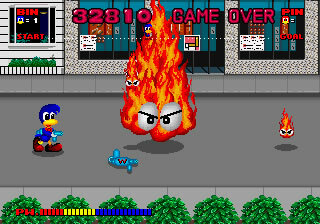 My favourite bad guy (and in my top five bad guys of all time) is the recurring giant ball of fire that spits out little bug-eyed flame babies that all need to be soaked with your water gun – you know you have to dispense with him, but you just don’t want to. Levels range from the opening street setting through jungles and cities in its six lovingly crafted stages. Bosses are a little repetitive, but serve their purpose, and the general level layout is a thing of beauty, as is the music which bops along in an upbeat fashion throughout. The added bonus of a two-player game (using the help of the aforementioned Pin) is simply the cherry on the cake for this tasty little gem. Now, playing the arcade game to death as I did, I found the home versions a little disappointing – most omitted the two-player game and some of the basic moves and enemies were scaled down to leave you with a slightly slower game. The poor old Spectrum version tries its hardest but the complete lack of colour (such a selling point of the game) leaves it looking pretty lame – plus some of the sound effects are akin to a bag of nails being dropped though a paper shredder. The Master System and Amiga versions were passable though (although Bin’s quiff would appear to have been trimmed), but it was the original arcade game that still leaves me full of teary-eyed nostalgia. 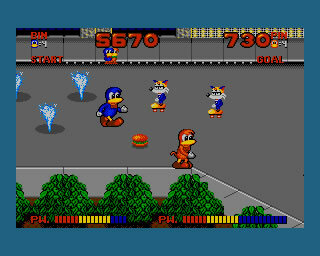 You can have all your photo-realistic monster games of today, but if I saw Dynamite Dux next to them all in my local arcade, I know which one would be getting my hard-earned 20 pences.